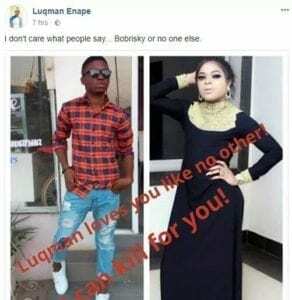 In a shocking post on Facebook, A Nigerian Man publicly profess his love for controversial cross dresser, Idris Okuneye, popularly known as Bobrisky. I don’t care what people say… Bobrisky or no one else… Luqman loves you like no other. I can kill for you.